I wasn't quick enough with the camera phone when I wrote this initial post, so I made a Photoshop mock-up instead. That Chelsea Sure Is a Friendly Place! One of the sad vestiges of New York's spectacular failure as a candidate city for the 2012 Olympics is the ill-considered ad buy on MTA buses. 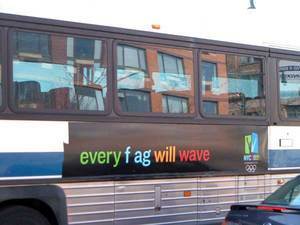 Nearly a month after the IOC gave us the ol' Heisman, the buses still sport banner ads proclaiming hopeful slogans such as, "Every Flag Will Wave." It calls to mind the brilliant spoof of the official logo that actually fooled a TV station in Australia. As a fag, I take the altered message at face value. It was probably intended as a subtle prank, as opposed to the more systematic and malevolent defacement of other NYC 2012 posters.